Not all chocolate is created equal: before it matures into bars and truffles, cacao beans must endure a long and trying puberty marked by fermentation, drying, and roasting, all of which determine chocolate’s ultimate quality. and farming techniques are intricacies that determine the flavor and overall scrumptiousness of the beans, much like coffee or wine. Fair prices, fair labor practices, and good working conditions for the cacao farmers are just as important as tastiness, which is why Maya makes an effort to visit cacao plantations in order to find out exactly where her chocolate is coming from. Maya offers time-tested european chocolate bars, but she is especially enthusiastic about her selection of the best and most precisely-made tablettes from up-and-coming chocolate mavericks in the U.S. While Maya is sent bean-to-bar samples from every corner of the world, she loves to watch independent chocolate makers grow, evolve, and multiply across the United States. 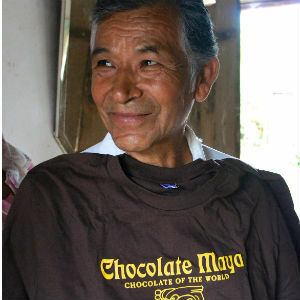 However, while all of us at Chocolate Maya are excited about the small-batch, bean-to bar chocolate revolution, our little shop is known for Maya’s handmade chocolate confections: a variety of velvety truffles and chocolate-dipped temptations that are made from the highest quality chocolate and fresh, usually local ingredients. Just don’t ask us which is our favorite, because between sage, chile, rose, or whatever new chocolate Maya has whipped up that season, it’s honestly too hard to choose. All that we know for sure is that ethically grown chocolate mixed with natural (and preservative free) ingredients and a dash of Maya’s Swiss savoir-faire is a simple recipe for pure deliciousness.